Why does the Claro Halo require four (4) OPAMPS for the Front Output? Each polarity signal produced by the AK4396 goes to two dual opamps (U8 for left / U10 for right). Each of those dual opamps handles only one polarity. Then both exclusively amplified positive and negative signal are reassembled and move onto the other opamps (U9 for left / U11 for right) for secondary amplification. U9 handles Headphone and RCA left output. U11 handles Headphone and RCA right output. 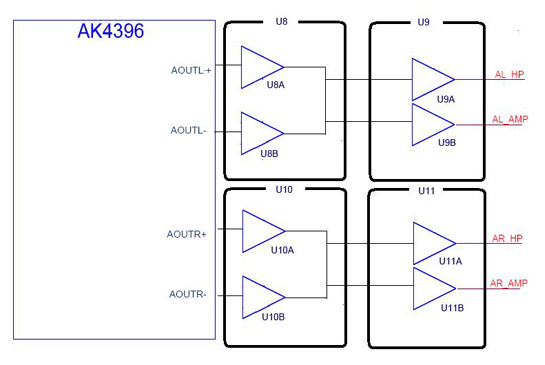 This design maximizes the capabilities of the AK4396DAC and also dramatically improves stereo crosstalk. If replacing the opamps, it is recommended that all four opamps are replaced together to attain your preferred analog signature. The factory installed opamps are 4580 (JRC). If you decide to swap only two (one set) of opamps, they must be the U8 and U10. There are markings on the PCB of the Claro Halo.